I love chocolate covered cherries. It is one of my favorite candies. So why not a chocolate covered cherry cake? YES? YES! 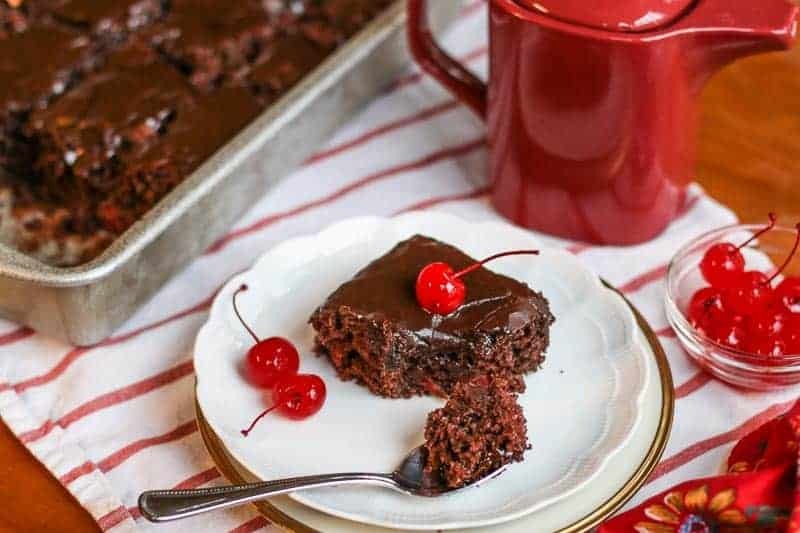 This Easy Chocolate Cherry Sheet Cake is moist and delicious filled with cherries and topped with a crispy, fudge frosting. 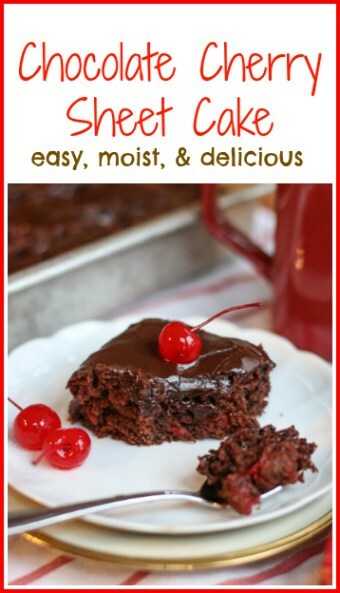 This Easy Chocolate Cherry Sheet Cake is so delicious. Maraschino cherries are mixed in with the batter. A homemade chocolate fudge topping finishes it off! If you are feeling really indulgent, serve it with a side of cherry ice cream! 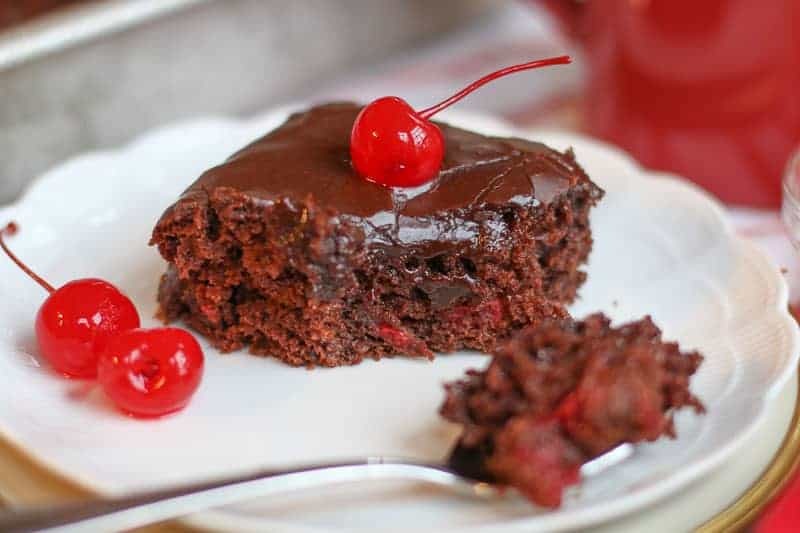 Everyone loves a good chocolate cake, but not everyone has had a chocolate cherry cake. You can make this for parties, cookouts, and family gatherings. It will disappear quick. Now, this is a semi homemade recipe…. Meaning the cake comes out of a box and the cherry filling comes from a can. I make alot of recipes from scratch. But if you can save a couple of steps and you have a winner for a dessert, why not? I have found the box mixes really offer a moist cake, often more than the completely-from-scratch versions. And if you don’t have a lot of time, why bother with unnecessary complications. Sometimes it is okay to skip a few corners. However if you feel you must make a chocolate cake from scratch, Taste of Home has a classic chocolate cake recipe. You can follow their recipe for the cake, add in the cherries, and follow my recipe for frosting. What is completely from scratch is the to-die-for crackly fudge frosting. 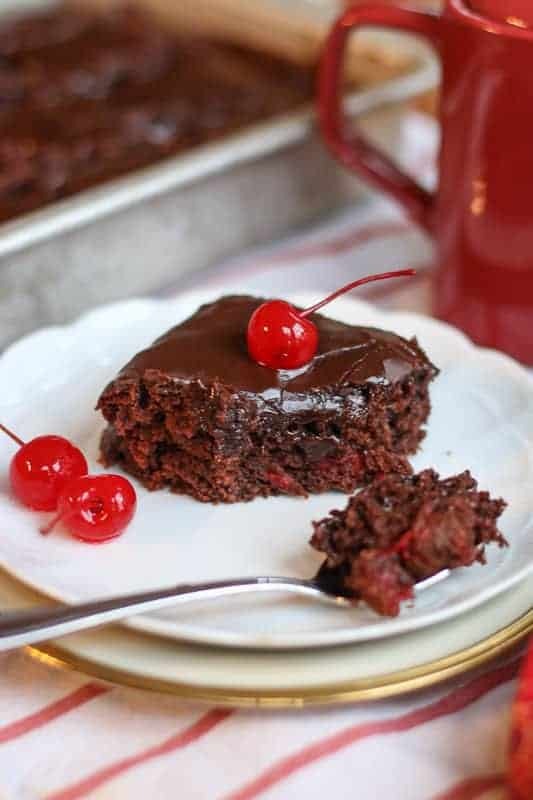 My husband says, “You can’t win friends with salad.” Let me tell you; you can win friends with this chocolate cherry cake topped with this home made fudge frosting. The frosting really makes the cake. If you like this recipe, check out: Chocolate Eclair Cake, Mexican Fried Ice Cream, Ooey Gooey Butter Bars. In a mixing bowl, mix cake mix, eggs, oil, milk, and almond extract until well blended. Mix in maraschino cherries and juice. In a greased and floured 9x13 baking dish, pour batter. Bake 30 to 35 min. In the last 5 minutes of baking cake, begin to make frosting. In a medium saucepan, combine milk, sugar, and cocoa and bring to a boil stirring continuously. Boil for one minute stirring and remove from heat. Remove from the heat. Add in butter, salt, and almond extract until smooth. Quickly spread over warm cake. Frosting will harden as it cools, so spread frosting on cake right away. Allow cake to completely cool on wire rack to allow frosting to harden. That was a typo. I am sorry. It is a 10oz jar of cherries. I hope you like it. This cake seems wonderful. I’m making it for Christmas. But in the ingredients list it asks for 2 10oz jars of cherries but in the video you only used 1. I used the video while I was baking so only used one jar. I hope it turns out. Yes. The extract just gives it a kick, but it would still be good. Could you make this without the almond extract? My son loves chocolate covered cherries and I think he’d like this cake, but he’s allergic to all nuts. 1/8 what salt? Teaspoon? Tablespoon? 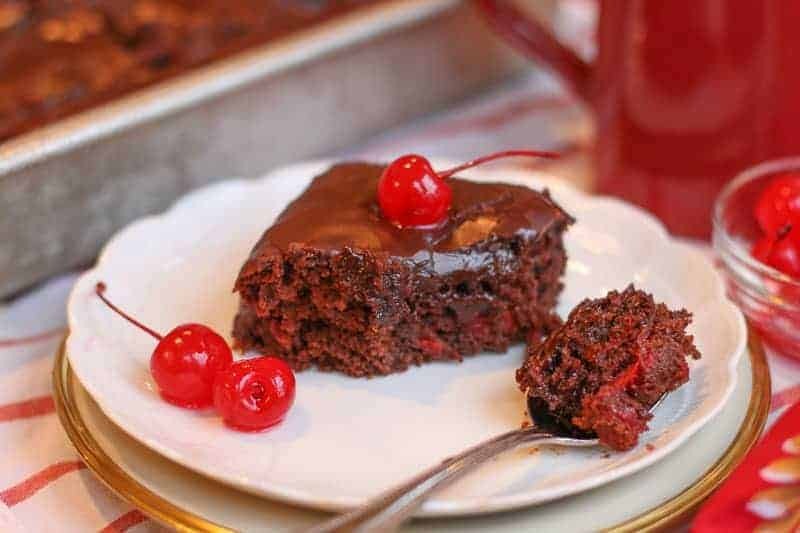 Devil’s food and cherries sound like the perfect combo. The frosting recipe sounds great, too – never thought to make my own but I bet it’s way better than store bought! Mmmm. I love chocolate with cherries!! And in cake form, delish!! What a fantastic dessert, Katie. I have an old fashioned recipe for a marashino cake, but it was NOT chocolate. Wow! That fudge frosting makes it. How wonderful. What a succulent treat you prepared, Katie! I love the creamy and chocolate texture, plus the cherry on the top! Yummy!